This is my story for the Weekly Writing Challenge: Iconic. I never thought of myself as a “replacement,” but alas, it is what I have become; a replacement icon of sorts while the original is in repair. My innards, once forgotten and quiet with dust are overrun with school children and replica shops. My fate hangs in the balance while greedy developers circle like sharks. There is talk of ripping me apart and rearranging my interior to the tastes of the richest elite. Is that better than the alternative of complete destruction? The answer depends on your definition of “destruction.” You see, I have been largely overlooked in the past, simply a structure worth a glance, but not a visit. I don’t blame you for always walking by and not wandering inside, for I am used to that treatment. In order to enter my presence, you must have strength of body and a purpose. My security detail is strict, and my entrance is uninviting and grim. My door is weighted by the force of the wind. Once inside, most marvel at my dilapidated opulence, and others mock my aroma. Fast food, is it? You may pass me off as a haunted structure, only suitable for a quick survey glance, or even worse, nothing more than a food court. You may know that part of me is a National Park, but I lack grass and trees and natural wonderment and the pristine beauty that you expect to see when you enter a park. It will not cost you anything to ascend to my highest points, but do not think that I am not valuable. The people of my city fought to save me from ruin in 1971, and I’m still around. Isn’t that worth something? I have a location that you want; it is not easy to find anywhere else near me. My quaint observation deck, hidden in my bell tower, sits high above neighboring buildings, museums, and restaurants that line Pennsylvania Avenue in Washington, DC. You didn’t even know I had one, did you? You have never been there. You stopped exploring when your eyes dilated in my lobby from the lack of natural lighting, and you smelled baked goods and grease cooking in my bowels. What am I replacing? You are most certainly asking at this moment. My task is not easy, for there are those who come to a swamp and are still eager with elevation excitement. If you get high from being up high, you are most definitely looking for a certain type of adventure. Tourists and locals alike come into my geographic area searching for the one place where they can quench their desire to be up higher. But it is not me who they are thinking about when they start their journey for means of ascension. When you arrive at your original intended destination, you will be disappointed to see the scaffolding surrounding its massive structure. You will be saddened to hear that it is closed indefinitely due to a freak earthquake in August of 2011. “How did that happen?” “Where will we go to find heaven?” You will ask. I am not the Washington Monument. I am the Old Post Office Building and Tower, and I too have an iconic observation deck, complete with famous bells: The Congress Bells, a bicentennial gift from England. I have seen more visitors in the time that the Monument has been incapacitated than I have in my whole life. I am second choice; I am second observation deck icon. I have been around since 1899, but you never cared to ask. I am no one to you, unless of course, you are looking for the second-best place to get the best birds eye views of downtown Washington, DC. People still laugh at the mockery that they have made of my courtyard by allowing vendors to sell tie-dyed shirts and cheap cigars next to stands of fried dough and lemon-flavored sugar water. But now, I am back in the spotlight. I am on your itinerary. I am your next destination. For something that used to be reserved for the local elite who were street savvy enough to seek me out, find my gem of a location and enter my grounds, I have come a long way. It is not easy being second icon to perhaps the most well-known, but I am giving it my best shot. The opportunity is giving me a new life. I feel young again! Come find me and explore what you can. You are lucky to have the chance before I too shut down indefinitely and disappear, only to reopen as Trump Towers, luxury hotel for the elite. I was in awe the first time I visited the Old Post Office Building & Tower…having been to DC so many times before, it was a hidden gem. And I think admission to the towers is free, at least the last time I went. It’s probably much more congested now after the earthquake shut the WM down. I sure hope it stays a DC Icon and not turned into some hotel (I think it houses a few offices now, etc.) … another DC Icon nearby is Hotel Washington, which was recently opened as the posh (and expensive) W Hotel. I used to stay at it as a teenager with my family when it was Hotel Washington, with their $110/night + breakfast rate, and rooftop, where you could get a drink for under $15. Thank you for your comment! Things do change so fast around here! 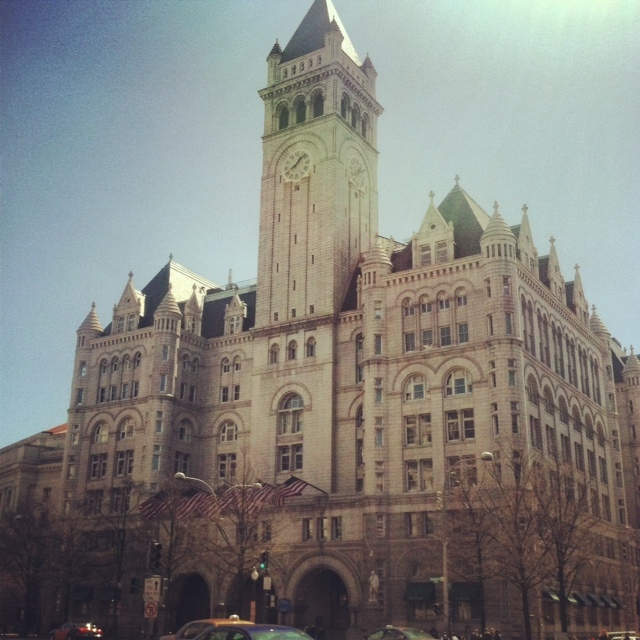 Both the Old Post Office and the “new” W Hotel are beautiful places to visit.